Doctors KILL over a ¼ Million people EACH year. Doctors are the 3RD LEADING cause of YOUR DEATH. Iatrogenic Disease is defined as a disease that is caused by medical treatment. Read major headlines around the globe on this serious disease. How Prepared are You to Not Become a National Statistic? If a Jumbo Jet crashed and killed 280 people everyday... 365 days a year... year after year... would you be concerned about flying?? Would you question the Federal Aviation Administration? Would you demand answers?? [What if] Close to 100,000 people dying every year from plane crashes? Well think again. What if you were told that over 100,000 people are killed and over 2 million people maimed and disabled every year...year after year from [by Doctors] modern medicine...would you believe it?? Well these may be my words...but read the following articles from the most respected medical journals and institutions (Journal of the American Medical Association, Harvard University, Centers for Disease Control, British medical journal The Lancet, New England Journal of Medicine and national news (New York Times, Washington Post, CNN, US World Report) and you be the judge. * The term iatrogenic is defined as "induced in a patient by a physician's activity, manner, or therapy. Used especially to pertain to a complication of treatment." 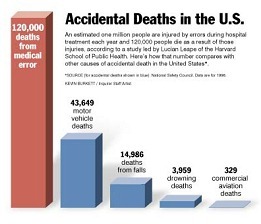 Furthermore, these estimates of death due to error are lower than those in a recent Institutes of Medicine report. If the higher estimates are used, the deaths due to iatrogenic causes would range from 230,000 to 284,000. Even at the lower estimate of 225,000 deaths per year, this constitutes the third leading cause of death in the U.S.
First, most of the data are derived from studies in hospitalized patients. Third, the estimates of death due to error are lower than those in the IOM report. 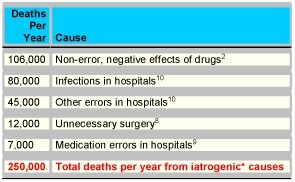 If the higher estimates are used, the deaths due to iatrogenic causes would range from 230,000 to 284,000. In any case, 225,000 deaths per year constitutes the third leading cause of death in the United States, after deaths from heart disease and cancer. Even if these figures are overestimated, there is a wide margin between these numbers of deaths and the next leading cause of death (cerebro-vascular disease). The high cost of the health care system is considered to be a deficit, but it seems to be tolerated under the assumption that better health results from more expensive care. However, evidence from a few studies indicates that as many as 20% to 30% of patients receive inappropriate care. An estimated 44,000 to 98,000 among these patients die each year as a result of medical errors. This might be tolerable if it resulted in better health, but does it? Out of 13 countries in a recent comparison, the United States ranks an average of 12th (second from the bottom) for 16 available health indicators. It has been known that drugs are the fourth leading cause of death in the U.S. This makes it clear that the more frightening number is that doctors are the third leading cause of death in this country, killing nearly a quarter million people a year. These statistics are further confused because most medical coding only describes the cause of organ failure and does not identify iatrogenic causes at all. Lucian Leape, a Harvard University professor who conducted the most comprehensive study of medical errors in the United States, has estimated that one million patients nationwide are injured by errors during hospital treatment each year and that 120,000 die as a result. In their study, Leape and his colleagues examined patient records at hospitals throughout the state of New York. Their 1991 report found that one of every 200 patients admitted to a hospital died as a result of a hospital error. That number of deaths is the equivalent of what would occur if a jumbo jet crashed every day; it is three times the 43,000 people killed each year in U.S. automobile accidents. "It's by far the number one problem" in health care, said Leape, an adjunct professor of health policy at the Harvard School of Public Health. Researchers such as Leape say that not only are medical errors not reported to the public, but those reported to hospital authorities represent roughly 5 to 10 percent of the number of actual medical mistakes at a typical hospital. "The bottom line is we have a system that is terribly out of control," said Robert Brook, a professor of medicine at the University of California at Los Angeles. "It's really a joke to worry about the occasional plane that goes down when we have thousands of people who are killed in hospitals every year." Brook's recognition of the extent of hospital errors is shared by many of medicine's leaders. Care -- not treatment -- is the answer. Drugs, surgery and hospitals become increasingly dangerous for chronic disease cases. Facilitating the God-given healing capacity by improving the diet, exercise, and lifestyle is the key. Effective interventions for the underlying emotional and spiritual wounding behind most chronic disease is critical for the reinvention of our medical paradigm. These numbers suggest that reinvention of our medical paradigm is called for. A panel of the National Academy of Sciences, in a highly critical report, yesterday called for a major national effort to reduce medical errors by developing a mandatory reporting system and asking Congress to establish a center to study them. The 220-page report, written by a 19-member committee of the Academy's Institute of Medicine, set as a goal a 50 percent reduction in the nation's "stunningly high rate of medical errors" within five years. It estimated that errors from medical treatment kill up to 98,000 people in U.S. hospitals every year and characterized the problem as among the nation's leading causes of death and injury. Several members of the committee said in interviews yesterday that the report was intended as a loud call to action for the health-care industry, which it said has not acted swiftly enough to address the causes of errors. "What it says is 'enough already,' " said Lucian Leape, a committee member and adjunct professor of health policy at the Harvard School of Public Health. "It's a matter of holding people's feet to the fire and stop talking about errors and start doing something." Based on a recent report by the Institute of Medicine, which estimates 36 error-related hospital deaths per 100,000 people, 3,534 Michiganians died last year due to medical mistakes. Patients reported 2,027 complaints about health care organizations to the state, but Tom Lindsay, director of the Michigan Bureau of Health Services, said those likely represent just a fraction of the mistakes. The NEW YORK TIMES reported that 5% of people admitted to hospitals, or about 1.8 million people per year, in the U.S. pick up an infection while there. Such infections are called "iatrogenic" -- meaning "induced by a physician," or, more loosely, "caused by medical care." Iatrogenic infections are directly responsible for 20,000 deaths among hospital patients in the U.S. each year, and they contribute to an additional 70,000 deaths, according to the federal Centers for Disease Control CDC). The dollar cost of iatrogenic infections is $4.5 billion, according to the CDC. A new poll from the nonprofit National Patient Safety Foundation (NPSF) finds that 42 percent of people say they've been affected by physician errors, either directly or through a friend or relative. If the survey of roughly 1,500 people accurately represents the general public, it could mean that more than 100 million Americans have experience with medical mistakes. More alarming, according to the survey, is the fact that in one out of three cases the error permanently harmed the patient's health. Dr. Leape is a board member of the NPSF, which was founded by the American Medical Association in June of this year to improve health care safety. AMA leaders say it's time to bring the issue out into the open, rather than living in constant fear that any admission of error will launch a flood of malpractice lawsuits. Leape's own research has shown that the tally of medical mistakes made each year could reach 3 million, with total costs as high as $200 billion. The survey found that 40 percent of the people who had experienced a medical mistake pointed to misdiagnoses and wrong treatments as the problem. Medication errors accounted for 28 percent of mistakes. And 22 percent of respondents reported slip-ups during medical procedures. Half of the errors occurred in hospitals, and 22 percent in doctors' offices.